I woke up at 2 a.m. this morning with an upset stomach. Something I ate last night didn’t agree with me. I spent a few hours in discomfort and then stayed in bed into the late morning to get some much-needed rest. When I learned to read, I gobbled up as many books as I could get my hands on, one after the other. It’s no surprise I chose to become a librarian, and now I’m a writer. My siblings all went to college and became working professionals. One of my brothers has written books and articles in his field of work. Mom influenced her children to understand the value of reading for forwarding one’s position in life, but also as a source of enjoyment. Thank you, Mom. This entry was posted in Uncategorized and tagged Reading on April 13, 2019 by lchavezdoyle. Book titles are important. I have often selected a novel to read, attracted by its title alone. Most recently, I came across the novel My Sister the Serial Killer, which caught my interest and made me laugh. Of course I read the book, but it didn’t live up to my expectations. Yes, it was funny, like the title, but not as funny as I’d hoped. Still, I did read the book. The Other Wife (Michael Robotham)–I couldn’t resist a story of bigamy. I Am Not Your Perfect Mexican Daughter (Erika Sanchez)–exactly what it says it is. Insomnia (Stephen King)–what can I say, I’m an insomniac. 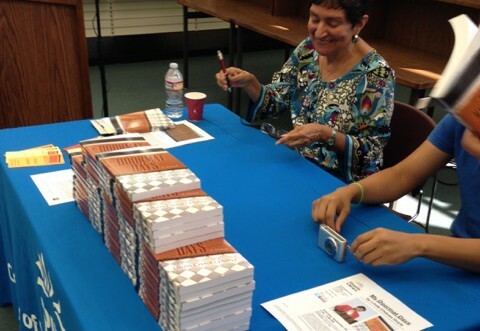 It’s Not About the Accent (Caridad Ferrer)–what I expected, a story about Latina culture, is what I got. When I started writing novels, my primary concern, of course, was developing a good plot. I didn’t begin to think about the title of my first novel until I was halfway done with the first draft. I initially chose the title, Tranquila, which sums up the state of confident happiness that the protagonist is trying to reach. One of my beta readers advised me to change the title, because it might be bypassed by English-language readers who could assume it’s a book in Spanish. I finally settled on the title, My Doormat Days, because it’s the coming-of-age story of a mousy young woman seeking to become more self-confident. It’s also a title that hints at the humor in the book. My most recent novel is titled White Mexican, about a young Mexican American woman struggling with her racial identity. Each time I mention the titles of these novels in conversation, the reaction is positive. The titles draw attention and interest, which every author hopes will encourage people to read the book. This entry was posted in Uncategorized and tagged Book Titles on March 8, 2019 by lchavezdoyle. The Woman in the Window by A.J. Finn. I could have read this book in 24 hours except I had to take time to eat and sleep. Unputdownable suspense thriller. The House of Broken Angels by Luis Alberto Urrea. I laughed out loud often, and I smiled at the bittersweet finale of this saga of a family living near the US/Mexico borderline. Kindred by Octavia Butler. A powerful depiction of slavery and its continuing aftereffect on modern American society (even though the present day in the book is 1976, it could just as easily be today). The Education of Margot Sanchez by Lilliam Rivera. A very good coming-of-age YA novel that focuses on the importance of appreciating the person you are and where you come from. The First Rule of Punk by Celia C. Perez. Yes, it’s a children’s book, but I think most readers would enjoy this story about learning to be comfortable in your own skin. This entry was posted in Uncategorized on December 29, 2018 by lchavezdoyle. ANGELA in The Wife by Alafair Burke. She is memorable because she is not what she seems. Truly an example of the unreliable narrator. ANNA in The Woman in the Window by A.J. Finn. So neurotic, but…wait…what else is going on with this character? This is a richly developed portrait of a damaged individual. DANA in Kindred by Octavia Butler. She is a fiercely determined woman who seeks to right what is wrong but against tremendous odds. ROY in An American Marriage by Tayari Jones. He is an African American male who is unjustly accused and incarcerated. He is a survivor. TOMAS in The Hummingbird’s Daughter by Luis Alberto Urrea. He is a philandering husband and a hedonist, but one who loves his daughter and risks his life to protect her. MARGOT in The Education of Margot Sanchez by Lilliam Rivera. Obstinate, reckless, and immature, Margot, a teen, learns the hard way that the choices we make can set us off on the wrong course. LAURA in Love Field by Virginia Alanis. She is impressive, because unlike Margot, she tries to make the right choices, but when she doesn’t, she recognizes her mistake and alters her course. She is wise beyond her seventeen years. These are the characters that have stood out the most in the novels I’ve read so far this year. I look forward to meeting more before the year is over. This entry was posted in Uncategorized and tagged Fictional Characters on October 19, 2018 by lchavezdoyle. Last month, a friend became aware that I am a huge fan of science fiction movies and television series, but that I rarely read sci-fi novels. She offered to share with me a DVD course “How Great Science Fiction Works,” part of the Great Courses series. I’m only halfway through the course, but I already feel that my eyes have been opened to a genre that I’ve previously pretty much ignored. Though I have read some sci-fi, I’ve often found it too action-oriented and weak in character development. But what I am realizing by watching this course is that sci-fi is also a fiction of ideas, often inspired by real world events. Often this genre will project into the future, basing plot, technological devices, and science on ideas that might only just be forming in the present day. For example, last year I read Octavia Butler’s Parable of the Sower, which is set in a dystopian California of the future, devastated by an ecological crisis. This book was published in 1993. One cannot read a newspaper today without being aware of the effects of climate change. Butler imagines a world where environmental change leads to people fighting over the scarcest resource: water. Over and over again, the Great Courses DVD gives examples of fiction that was ahead of its time. This has prodded me to pick up some science fiction and check it out, give it another chance. I just finished Butler’s Kindred, which is impressive (though I think it’s a stretch to call it sci-fi when the method of time travel is never explained). Next, I’m considering taking on Dune by Frank Herbert. Maybe. If not Dune, certainly I’ll try one of the other sci-fi classics recommended in this course. This entry was posted in Uncategorized and tagged Science Fiction on September 7, 2018 by lchavezdoyle.